A fun and visually entertaining way to learn the most commonly used greetings in Te Reo Māori. Learn which Maori greetings are appropriate to use when greeting people, asking after their health and saying farewell. There are a number of variations when using greetings in Te Reo Māori and they are all covered in this resource. 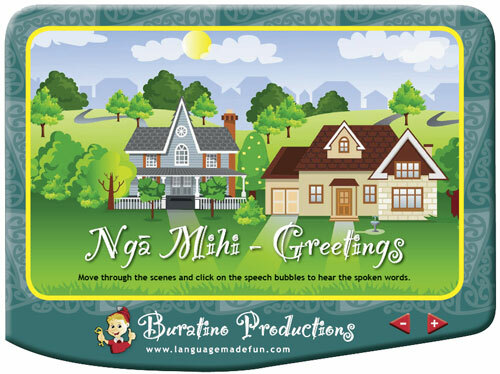 Created with the assistance of William Karaitiana, BEd, MBA, this interactive resource is designed to help Māori language beginners learn a number of useful greetings to use for different situations. It is ideal for using in classrooms on an interactive whiteboard or on a computer. PDF download with embedded sound, featuring 15 scenes and 16 phrases. Easy and interesting to use for students of all ages – just click on the speech bubble to hear the spoken greeting. Each one is matched to its English equivalent. A teacher friendly resource allows you to learn with your students. 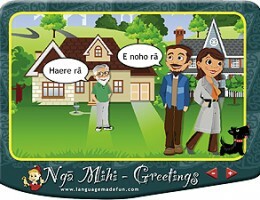 A great Maori language beginners’ revision tool.